Middlesbrough Football Club is a professional association football club based in Middlesbrough, North Yorkshire, England. Formed in 1876, they were one of the founding members of the Premier League and have played at the Riverside Stadium since 1995, their second ground since turning professional in 1889. The stadium was originally a 30,000-seater stadium, constructed at a cost of £16 million, before it required capacity expansions in 1998 at an extra £5 million cost. 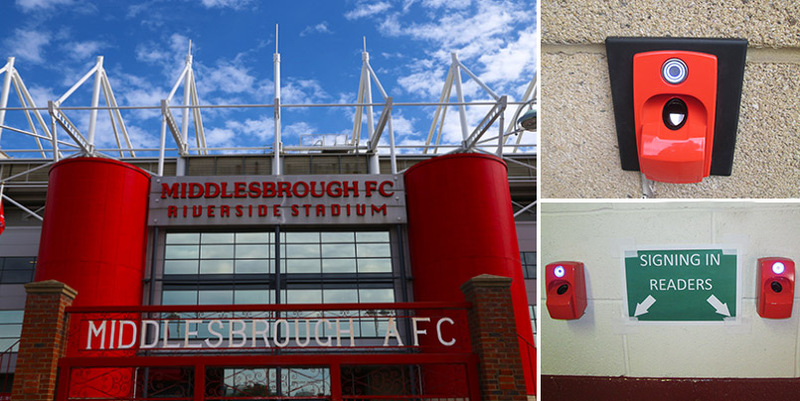 With a return to the premier league for the 2016-17 season the Riverside Stadium required a few facility updates to meet premier league requirements, at the same time the security of the stadium was also upgraded. The currently underused mag-stripe card system for access control was highlighted as a priority system to be replaced with a robust, reliable and advanced biometric system. The core requirement of functionality was to provide an enhanced security system to allow for a reliable and easier method of time and attendance monitoring and data capture of matchday staff, which tended to take managers a long time to process for other departments use (i.e. payroll). Talking with access control suppliers, BSB Progeny, who provided a new, state of the art access control system for the stadium, ievo Ltd was recommend as a preferred biometric solution. The original proposal was for 4 ievo ultimate™ readers to be installed to control matchday staff’s entrance and exits to and from the stadium, 2 readers were assigned for ‘signing in’ and 2 more for ‘signing out’. After installation and seeing how easy and accessible the system was, this installation was increased to 8 ultimate readers and 2 ievo micro™ readers to allow for more flexibility in use. Three ievo desktop readers were used to allow for staff to easily register their fingerprints on the system. Following on from seeing an improvement in efficiencies and effectiveness, the system was further enhanced by more readers to provide access control on restricted, staff only areas. From the time and attendance intention of saving managers time of processing post-match staff attendance data, there has been a 300% increase in time saved, before the new system managers could take up to 48 hours to format and process data, which has been decreased to approximately half a day. The time saving and cost effective system has impressed the team at the Riverside Stadium to the point that further extensions of the ievo system is being considered for future development.